If you’re finding the wait for James Ellroy’s new novel Perfidia to be unbearably long, then I would recommend the recently released James Ellroy: A Companion to the Mystery Fiction by Jim Mancall. 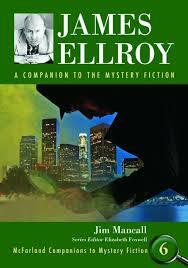 Mancall has written articles about Ellroy before and clearly knows his stuff. The book is arranged as an encyclopedia so L is for L.A. Confidential etc., and is a delight to dip in and out of. I was gratified to see Mancall references Conversations with James Ellroy quite a bit, including a close look at the intriguing Duane Tucker question. What I am enjoying most about the book so far, however, is the short biographies of Ellroy’s minor and major characters. It’s interesting to read about Duane Rice and Lenny Sands and Ross Anderson as individuals and not just as characters in a larger narrative. The companion is both an authoritative and enjoyable read.